University of Ulster academic Trish Belford is teaming up with colleagues at Manchester Metropolitan University to investigate how traditional textile printing methodologies could be applied to contemporary designs. Trish, who is a Senior Research Fellow in the School of Art and Design at the Belfast Campus, has a proven track record for innovative and creative textile design. Originally from Northern Ireland, she trained in London before establishing her own textile design company in London Docklands. 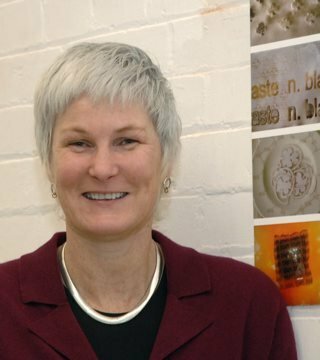 Her company developed new print techniques for high end fashion market for clients which included Vivienne Westwood, Jasper Conran, Donna Karan and Zandra Rhodes. A Leverhulme Research Project Grant of up to £111,648 over a two-year period will fund her study, which is to be called: ‘Experimental archaeology meets textile design: the rediscovery of shadow tissues’. The grant will also facilitate a full time research assistant to work on the project. Trish explains she will be conducting the research in collaboration with Dr Philip Sykas of Manchester Metropolitan University. Their aim is to investigate a lost textile technique known as ‘shadow tissues, working with the original samples from the unviewed archives of Turnbull and Stockdale. “The research aims to recover technical information about developmental contribution to this printing method, and then to apply this knowledge to creating trial-stage contemporary textiles,” continues Trish. Paul Turnbull is currently a visiting Professor at Ulster, is the fourth generation of the Turnbull family which established the Lancashire firm of Turnbull & Stockdale Ltd. The firm was established in 1881 and the company’s hand block-printed textiles are considered to be among the most interesting from the late 19th and early 20th centuries. Professor Turnbull is now the owner of Turnbull Design, a prestigious international textile printing, weaving and embroidery company. Their design studio is in Lancashire and production is Thailand-based. Professor Turnbull first visited the University’s Belfast campus in January 2009 to present a seminar to Art & Design staff.